Before the Monster Energy NASCAR Cup Series headed to Fort Worth, Texas, for Sunday’s O’Reilly Auto Parts 500 at Texas Motor Speedway, the seventh race of the season, Kevin Harvick had dominated, winning three of the first six races, while Kyle Busch had finished second in three of those first six. But Sunday, the roles were reversed, with Busch celebrating in victory lane while Harvick was the runner-up. “They were probably just a tick faster overall, but I just had to make sure to do everything I could to hit all my marks and everything to focus on making sure that I did the right things to block his air a little bit,” Busch said of his late-race battle with Harvick. 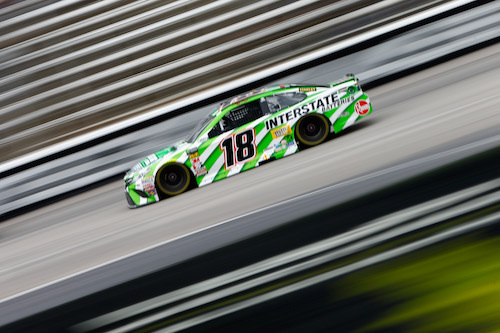 Harvick and Busch also were the stage winners, with Harvick dominating the opening 85-lap stage, and Busch taking the lead with three laps remaining in the second stage that was led by both he and his brother, Kurt Busch. Harvick went a lap down about halfway through the second stage. After a problematic pit stop under yellow, he was forced back down pit road with a loose wheel right after the race restarted. Ryan Blaney also had to make an extra pit stop a few laps later, also for a loose wheel. Blaney was off the lead lap for a second time, as he went a lap down earlier in the race because of a pit-road penalty. Blaney got back on the lead lap the first time by unlapping himself on the track just before the end of the first stage. He got back on the lead lap, again, as the the free-pass recipient during a caution early in the final stage. Harvick got back on the lead lap when the yellow flag waved during a cycle of green-flag pit stops with just under 100 laps remaining. He had yet to pit, and as a result, was on the lead lap because the leaders had already pitted. Erik Jones got out of the pits first to restart as the leader at the beginning of the third and final stage, but Busch retook the lead on the restart that followed the same caution during which Harvick got back on the lead lap. Harvick got up to second by the time the final cycle of green-flag pit stops began inside the final 50 laps. Ricky Stenhouse Jr. and Darrell Wallace had yet to pit under the cycle when the yellow flag waved for the eighth and final time with about 30 laps remaining. When they pitted during the caution, Busch and Harvick moved up to first and second for the restart. As they battled for the lead in the final laps, a lead Busch wouldn’t relinquish, Stenhouse suffered a vibration that resulted from a broken brace, and Wallace drifted back to eighth by the checkered flag. Jamie McMurray, Jones and Blaney finished third through fifth, respectively. Other top-10 finishers included Joey Logano, Kurt Busch, Wallace, Clint Bowyer and William Byron. The race was attrition-filled, including two wrecks that involved several cars. Alex Bowman, Paul Menard, Daniel Suarez, Ross Chastain and Austin Dillon were involved in an on-track incident on lap three. Denny Hamlin, Brad Keselowski, Jimmie Johnson, David Ragan, Dillon and Aric Almirola were involved in a wreck on lap 179 that resulted in a red flag for track cleanup. Other drivers that ran up front before wrecking included Martin Truex Jr. and Kyle Larson.